Disc Filter acts as a safeguard to protect the motor. Incoming air and dirt are deflected by our patented Intel Guide creating a centrifugal force, pushing dirt and dust to the sides of the container, away from the cones. The air does not have to force its way through the layers of dirt like in a "vacuum" cleaner bag, instead it is drawn into the center of the "cyclone" where it filters through the cones and returns to the room cleaner and freshener. The Genuine Filter Cone is exclusive to Filter Queen®! The integral part of our filtration process begins with this filter cone composed of patented two-ply Cellupure™ fibers. This filter helps block the passage of dust, pollen, allergens, and other contaminants while protecting the motor of the Majestic®. When changed as recommended, it protects the life of the other filters. 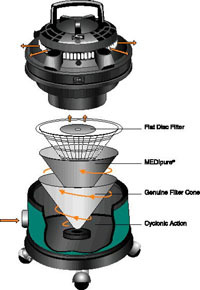 The MEDIpure® filter is actually two filters in one. The outer filter's main component is activated charcoal. Activated charcoal helps remove noxious odors found in the home. The inner filter is a non-woven microfiber media that is so effective at repelling dirt and dust, the interior remains hospital white. It helps remove the pollen, dust mites and dust mite allergens, mold spores, and pet dander that can trigger allergies and asthma. The Enviropure® is an activated charcoal filter that should be used in addition to the MEDIpure® filter in extreme conditions. It will help protect the MEDIpure® filter in a home with heavy smokers, heavy cooking, odors, etc. 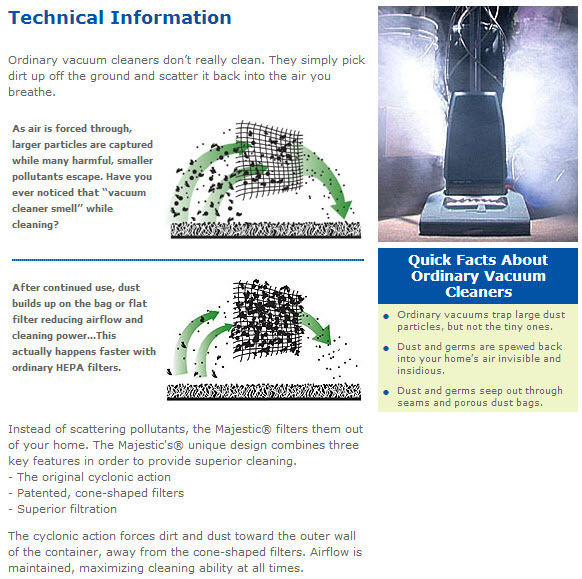 The MEDIfilter® provides better than HEPA filtration for cleaner, fresher air. This filter is composed of a single-layer, non-woven fiberglass media. The Enviropure® is an activated charcoal filter designed to help remove over 300 toxic gases and odors from the home. How small is 0.1 micron? If a speck of dust was the size of a basketball, a particle of 0.1 mircon would be the size of a marble! A human hair is about 100 microns in diameter. High Efficiency Particle Arrestance is the industry standard which is 99.97% efficient at 0.3 microns. The Defender's® unique MEDIfilter® cartridge has been independently tested to remove 99.98% of particles at 0.1 micron. This is better than HEPA! Motor life tested at 850 hours. • 12 months, renewed by replacing MEDIfilter® each year.